As a fiber artist, I have used natural dyes to color handspun yarn. I have dyed with onion skins, indigo, coffee, usnea, wolf moss, and tumeric; however, I never thought of using natural dyes on eggs before. In fact, I am embarrassed that I did not think of it myself, but Martha Stewart did! Last year was the first year we dyed Easter eggs, at my daughter’s request. Against my will, I bought food coloring, as I felt guilty for denying her so many holiday traditions in the past. This year, we will use natural dyes on eggs bought locally from a friend. 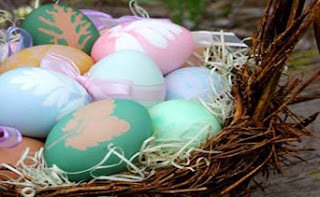 If you are interested in naturally dyeing eggs, please visit The Green Guide for more information. Those are beautiful egss and I really like that idea myself. I think I’ll plan for that next year! This year was just vinegar and food coloring from our natural food store. Then again, now that I think about it, it was natural dye, since the food coloring were based on berry juices. Still, thanks for posting this and getting me thinking about it! Wow, I didn’t know there was natural food coloring. I’ll have to look for it at our coop. Thanks!